I guess maybe you already know that, or you wouldn’t be here reading a blog post on Inspy Romance. :) But He just keeps amazing me more and more, the way He works in my life, and the places He takes me. Today, He took me to Dr. Seuss. As a kid, I loved his books, read all the local library had a dozen times over, asked for them for Christmas, birthday, and whatever-else-excuse-I-could-think-of presents! But I only just discovered that his first children’s book was rejected by twenty-seven publishers. Dr. Seuss’s Oh, The Places You’ll Go is a book that’s often given to kids (and adults too!) starting a new phase in their lives. It’s about trusting our inner guidance and keeping on going, through good places, tough places, and sticking it out till we achieve our goals. You’re on your own. And you know what you know. And YOU are the guy who’ll decide where to go…. Being able to steer ourselves any direction we choose is an awesome thing. But it’s also scary. It does feel so much like we’re on our own! That’s exactly how I’ve felt about starting my newest story. Scared and on my own! Normally, I plan my books. I never have a completely detailed outline, like a full street map with every tiny alley marked. But at the very least I know the main landmarks I need to turn at and some of what I’ll see along the way. I like that process. It feels secure. I know where I’m going. I know I’m not going to get sidetracked off onto the scenic route and add fifty miles extra to my trip. Especially important when I’m writing to a deadline and don’t have time to take the scenic route, no matter how pretty it is. I learned this from my first few completed stories — huge messes, ALL scenic route, no plot! So now, before I start, I plan. Today He made it clear. I have to pants it. I have to just start writing and trust that like the kid in Oh, The Places You’ll Go, I know what I know, enough to get to The End. The truth is, I don’t know enough. Nowhere near. But God reminded me — He does. I need to trust that if He’s asking me to pants this one, I don’t have to know everything yet. He’ll make it clear when I need to know. So the writing process is a metaphor for my life. He wants me to trust Him, to not need it all planned out. He wants me to know that it will be okay because He will be with me, guiding and supporting me. I just need to stay open to Him. My “word for the year” this year was Surrender. Next year’s will be Flow. And it looks like in these last weeks of the year, He wants me to combine both. Surrender, AND Flow. The good thing is, He’ll help me to do that. He knows where I need to go, even when I don’t. What ways are you feeling God’s leading in your life right now? Or which was your favorite Dr. Seuss book? Or for the writers here, plotter or pantser? All comments before December 6th go in a prize draw for one of my ebooks. And if you want to stock up on some free Christmas reading (including my winter romance with a 50-something hero and heroine, Least Expected), don’t miss this Christmas sweepstakes! There are lots of free romance ebook download links on offer, as well as the chance to win a Kindle Fire and other prizes, in return for author newsletter subscriptions! Not all the books included are clean or sweet, so please be sure to select only the categories you feel comfortable looking at, and scroll carefully! The sweet and clean romances are grouped together at the top of the page. What a timely post! Last week, our oldest son (8yrs), was diagnosed with profound deafness in his right ear. With all the other medical issues going on for him, this felt like just another to add- for me, overwhelming to say the least. But, as you so aptly put it, God works, even through things like this…we have been able to get appointments to specialists very quickly and have been blessed with a great church family who support us. 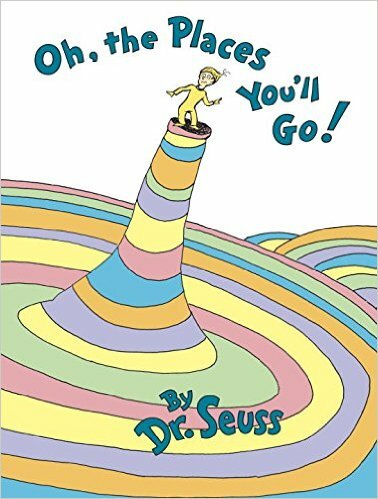 “Oh the places you’ll go”, and “I had trouble getting to Solla Sallew” have to be my favourite Dr Seuss books- both remind me that God is in control and that I need to just keep stepping out and having faith! I am a planner…so the stepping out part is rarely easy. Praise God for His guidance and that He is faithful. I’m sorry to hear about your son, Wemble. I’ll keep him and your family in my prayers. Thanks Jill, appreciate it, God is Good! Hugs! I’ll be praying for you and your son. I’m tearing up thinking how tough it must feel for you at times. Even though we know we have a God who loves and supports us, we can still get overwhelmed. So glad the appointments he needs are coming together. That part of stepping out in faith is the hardest, I think, for most of us. Especially when it’s not just us, but someone we love. Fantastic post, Autumn! I’m not sure I can pick one Dr. Seuss book, they’re all wonderful. Lately, I’ve felt God’s lead to slow down a bit. It’s so easy to try and push ourselves, but sometimes we need to rest. I struggle with that. As for writing…I’m a pantser who follows God’s direction. It’s an interesting thing that naturally winter should be a time to slow down and rest more, yet in our society we tend to push ourselves harder! Electric lighting is such a blessing, but it also separates us from the early evenings and long nights that tell us we need more sleep and rest! Hope you get what you need. Thank you so much for this post. It’s most appropriate for me and I needed that because of how I’ve been feeling. Stuck!!! I also realized that while reading the bible for the year, it has led me to be a little more patient and trusting that God has HIS plan for me. I have never read that Dr. Seuss book but it speaks volume based on your blog. It will be on my “to read list” of inspiration. He does have a plan for sure, Colleen! Stuck is such a frustrating place to be. Sometimes when I feel stuck, it’s because God is whispering to me what He wants me to do, but I’m so busy focusing on my own plans I’m not hearing Him. But often it can be because I want to push on with something, and His answer is “Not yet.” It sounds like that’s what your discerning. That can be the hardest, those times we have to learn patience and trust and wait on His perfect timing. Prayers you feel His hope and peace covering you! I like the connection you’re making with your life and writing process. I sincerely wish you’ll find a nice flow for your book (and life).. though from knowing well your books, I’m sure you’ll get there. Surrender is an amazing word, but so hard to live. I’m probably copying you and making it my word for next year. I love to plan too, but right now planning has been hard (too many new things everyday) and I’ve been having to deal with one thing at a time and often things get delayed or messed up. Yesterday, for example, I was delayed in the morning because furniture was being delivered for our new nursery and I had to stay home waiting, then rushing to a medical exam (all fine with the baby, btw), and attend a couple of meetings at work… one of which I completely forgot and had to reschedule for today on top of all the work that I didn’t do yesterday that had to be pushed to today because of furniture delivery and meetings. So instead of working, I feel like I’m actually just running around and catching up. Priscila, I almost feel like I should make surrender my word for the year again next year, as I still have so much to learn about it! But when I asked Him (early this year because a friend was discussing her word choice for next year) God told me flow. So flow it is for 2017. I think I’ll find flow has a huge element of surrender in it anyway! Thank you. I like the idea of flow..
Actually, the whole idea of having a word choice for the year sounds pretty nice and kind of brings peace. I have never thought about it too deep, but I’ve been thinking since reading your post this morning and right now I’m actually wondering if I should go with rejoice instead. Or maybe just a mix of surrender and rejoice because it will definitely be the year our first child is born, and although I’m taking a leave from work, it will mean more like cutting down my hours than actually stop working entirely after the first two months. I am really excited to be having a baby, so rejoice would be perfect, but I know the rest of our lives will require surrender if we want to make sure we have an okay year professionally. It’s going to be an exciting time for sure! A real adventure and every day will be new. Rejoice and surrender go together perfectly, just like surrender and flow. I love your idea of joyful surrender. That’s probably the best possible way to approach motherhood, too! Autumn, thanks for this post with a wonderful message. Great post! I love Dr. Seuss books. Can’t pick just one. Definitely a panster. I’m working on a story for NANA and I have no idea where it’s going. God says write. I write. He knows where it’s going. I’m following. We’ll see what happens! Sounds like fun, Sally! Scary, maybe, but fun. I am soooo having difficulty letting go and flowing with whatever words God gives me for this story. But He definitely knows where we’re going with whatever we do, way better than we do! Where you talked about God telling you just to write and trust Him to pull it together? I’m there every day. I tried so hard to plot books for years, but I just can’t do it. I blame God. Seriously! I believe He made me this way so I wouldn’t have any choice but to depend on Him each day for the next part of the story. On my current first draft, I’m finally to the place (about halfway in) where the pieces are starting to connect in my mind. It’s been like doing a jigsaw puzzle in the dark (as always) and realizing something is being created that I can’t really claim ownership of. He is sneaky like that! ;) Like my illness, I know the gift in it is that I lean on His strength not mine. It seems to work better that way! I love that point in a story where it all falls into place. For me, it’s usually somewhere in the third draft. I LOATHE first drafts. LOL, maybe because it’s such a battle for me to let go and let God do it through me! Psalm 37:5 is our family’s life verse for four generations. It helped my mother survive the Russians bombing her home during WW2. It was the verse given to her at her wedding at the end of the Berlin Airlift – July 1948. It was the verse her church gave her when she immigrated to America. It was the verse the church welcomed her in America. Mom told me how God lead in her life, I passed that on the my sons, who are passing this on to their children. While planning is important, it is also important to follow God’s leading in our lives. God’s ways are the best ways, even when we don’t understand them at the time. I, my youngest son, and grandchildren all enjoy reading Dr. Seuss. There are so many great examples in history of people who did not succeed at first, but tried, tried, again. Renate, your heritage is such a real and powerful thing. So important to pass that on down the family. I am glad your grandchildren have that gift. Yes, that verse! It can carry us through so much. 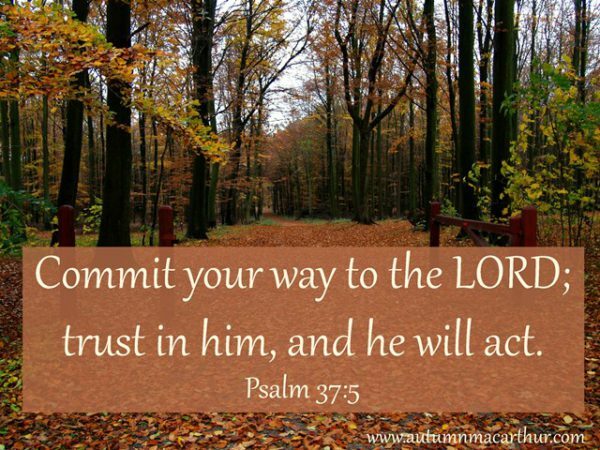 God promises – He WILL take action! Thanks for the post it was encouraging. We are facing a, for us, large move from our home of 3 decades. We just got a huge quote on some work that needs doing. It is tempting to despair But God is good and will make a way. …..on to the next estimate! Praying you either get a great quote, or that the way to pay for the work is provided. Or both! A move is such a big thing. Always a bit scary. Hopefully exciting too, as you find new possibilities. Hi Autumn, My fave is Green Eggs and Ham, and I share your love of Dr. Seuss books :) All the best for your next book project. I prefer to have a detailed outline to work from before I start writing. We liked Green Eggs and Ham best in our family, too! Maybe that’s an Aussie thing? LOL! I know Dr. Seuss’s birthday is on my grand-girls…March 2nd :-) How cool is that?? Following Him means those times of waiting, too. I find those harder than when He’s got me on the move, I itch to get doing and push my own plan. Oops! But yes, you said it, those times are what builds our faith and trust. Cool shared birthday! You have grand-twins? LOL, yes, keeping up with one three-year old would be plenty enough!